Home » Game Reviews » Grog Island: A Completely Different Kind of Piracy! Grog Island: A Completely Different Kind of Piracy! Written by: KristaG on December 9, 2015. This is probably the hardest game review I’ve ever had to write. How could I possibly write something about a game that deep down I know I should love yet with the first few games we played, I absolutely could not find something positive to say about it? Let’s start at the beginning, I suppose. 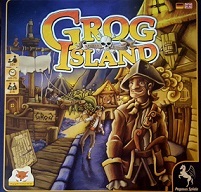 I have been looking for a new pirate themed game for quite some time, so when I learned that Passport Game Studios was going to begin distributing Pegasus Spiele’s Grog Island this year, I jumped for joy and could hardly contain my excitement! It arrived at my door step and I quickly grabbed my Player 2 and we sat down to play. I was immediately drawn to the pirate meeples and the auction mechanic using dice, however, once we started playing, it became apparent how heavily the game relies on rolling high for the first few auctions if there are only two players. If players roll lower numbers, the game is so quickly unbalanced that it became frustrating for us if you were the losing player as there was no way to even hope to catch up. Even with the simulated third player for 2-player games, it just wasn’t working out if we rolled low numbers. I was devastated as I had been looking forward to this game for months! As I struggled with what to write, I talked to a couple of my fellow reviewers to see what they had thought of the game. I got mixed results, but there were enough positive ones that I gathered up a larger group (Grog Island is playable for 2-4 people) and tried again once I could get us all together. The experience was exponentially better! Grog Island is definitely a game that requires player interaction to make it fun. The auctions in the game, like so many in real life, tend to be much more entertaining and enjoyable when there are more people involved in them. Competing for businesses or getting goal cards completed becomes much more of a necessity as well as a challenge. How far are you willing to push your luck? Are you able to let this one auction go and try your luck at the trade ships to gain more money, goal cards, or goods and try again for the next one or is everything riding on this one bid? The Ghost Ship and White Pirate meeples used in 2-player games. Unlike most pirate games, players aren’t just assuming the role of pirates going out to plunder the seas. Instead, these pirates are retiring from their plundering days, but still want to earn a little money. To do this, they are buying up legit businesses and benefitting from other pirates and patrons that visit their shores. There are 2 playable modes depending on the number of players involved. 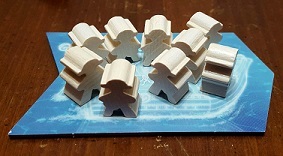 The 2-player version has a simulated third player using a ghost ship on the trade row and uses 9 meeples of an unused color (we tend to use the white ones for this to fit the theme) for her ghostly crew. To set up the game, first set up the game board within reach of all of the players. Then shuffle the cloud tiles face down and distribute them above each of the colored peninsulas at the upper edge of the board. Once distributed, flip the cloud tiles face up. This is done so each time you play, the rewards for claiming buildings on a peninsula is different every time. This process is repeated with the ship tiles on the lower portion of the board (specific rules on how to do this are listed in the rulebook). However, my group tends to skip this step and we just shuffle the tiles face down and flip them over as they’re placed on the board to save a few moments of setup. The three micro-card decks (treasure cards, parrot cards, and goal cards) are then shuffled and placed face down on their respectively marked spaces on the board. 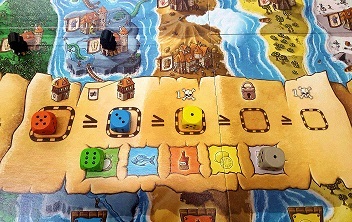 The goods tiles are separated by type (rum, fish, limes, oranges, and treasure maps) and placed at the bottom of the board as a general supply. Each player then selects a color and receives the appropriate number of crew members based on the number of players in the game (9 meeples for 2-3 player games, 7 for 4 player games) along with their color corresponding trade marker, “20+ coins” marker, and overview card. Then it is time to divvy out the starting hands for each player. Six cards each are dealt from the goal card stack, but players only get to keep four of their choice – the discarded cards go back on the bottom of the deck. Players also each receive one treasure card, one parrot card, and one goods tile of their choice. Game play is fairly simple. The first player, chosen by the player that can make the grimmest pirate face, rolls the 5 wooden auction dice and places the dice onto the goods space of its matching color in the auction area. The first player also gets to make the opening bid. Players may bid one or more dice at a time, using each pip on the die as being equal to one coin. There are full rules explanations for auctions in the rulebook. After the first bid is made, the auction round continues clockwise and each player may then raise the current bid or pass. If a player passes, they drop out of the current auction and immediately receive goods for unoccupied goods spaces on the auction row and trade with a merchant ship. The winner of the auction will gain only the rewards of the occupied bidding spaces. These rewards include claiming a building, earning pirate points, or placing a lock on a building. 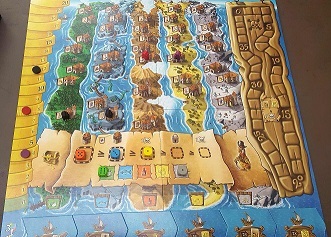 After the auction has ended and the auction winner has finished reaping his rewards, all of the ships in the trade row shift over one position to the right and the first player token is passed to the player on the left. The game ends after the auction round where at least one player has placed his or her last crew member onto a building. Once this happens, the final score is calculated through various ways and the score marker tokens are moved along the pirate points track. The player with the most pirate points in total wins the game. As I stated above, this game is one of the hardest ones I’ve had to write about. It really does require the player interaction. That being said, the group with which you play it with will most likely make a huge difference as well. I like it quite a bit at the four player level and simply wish there was a way to keep it balanced at the two player level as I rarely get to have my whole game group together. I would recommend it for anyone looking for a twist on a pirate game that has an active game group that loves a little friendly competition!